It is shaping up as a tough race for the punters at Moonee Valley on Friday night in JRA Cup 2017 betting with five of the stayers in the mix under double-figures for the win. Kiwi stayer Jon Snow has his first run at The Valley on Friday night as one of the best chances in the 2017 JRA Cup odds. Photo: Steve Hart. Due to run as Moonee Valley Race 5 at 8:30pm (AEST) on the Moir Stakes Night line-up, this season’s Group 3 $200,000 MSC Signs JRA Cup (2040m) attracted a 13-starter field of potential Group 1 spring performers. The race serves as a nice lead-up into something like the Group 1 $3 million Caulfield Cup (2400m) on October 21 and plenty in the JRA Cup field are among the entries for the mile and a half classic. Current JRA Cup odds at Ladbrokes.com.au have Star Exhibit as the $4.40 favourite, the Darren Weir-trained stayer at an easing price to return to winning form from a wide barrier 12 draw. Damian Lane partners the six-year-old who is best known for his Group 2 Perth Cup (2400m) win back on New Year’s Eve in W.A. 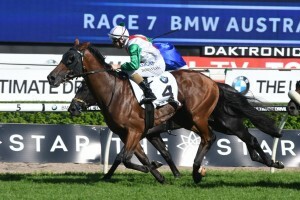 Runner-up in the winter’s Group 1 Doomben Cup (2000m), Star Exhibit is out to atone for two luckless runs this time in. First-up he was ninth past the post at Caulfield behind Hartnell in the Group 2 P.B. Lawrence Stakes (1400m) before the gelding lost his rider (Mark Zahra) at The Valley on September 9 in the Group 2 Dato’ Tan Chin Nam Stakes (1600m). The bookies are tipping the son of Statue Of Liberty to have better luck under the lights this weekend getting out over a better distance despite the 57.5kg weight on his back. Occupying the second line of JRA Cup betting is the early market mover Foundation ($5) who carries 54.5kg, the Lindsay Park-trained Zoffany five-year-old looking to improve on a close run at the track and distance earlier in the month. Foundation finished eighth in a handicap at Moonee Valley carrying 58.5kg on September 9 where he endured a tough run from the outside barrier (14 of 14). He gets a better go of it from gate nine this weekend and drops four kilos in weight, looking every chance to finish in the money having been beaten only one and three-quarter lengths last time out. Following closely at a current quote of $5.50 is the Kiwi-trained Sydney Group 1 winner Jon Snow for Murray Baker & Andrew Forsman. Stephen Baster has his third straight ride aboard the four-year-old Iffraaj stallion who enjoyed a stellar autumn in Australia winning the Group 2 Tulloch Stakes (2000m) and Group 1 ATC Derby (2400m) on rain-affected tracks in Sydney. This season he has been to Melbourne twice for a sixth to Vega Magic, beaten only three lengths as a $61 roughie in the unsuitably short Group 1 Memsie Stakes (1400m), and eighth to now 2017 Caulfield Cup favourite Humidor in the Group 1 Makybe Diva Stakes (1600m) at Flemington. Jon Snow sees the notoriously tight Moonee Valley circuit for the first time in the JRA Cup but should be nearing peak fitness third-up and will appreciate the extra ground. The other best in betting are the veteran Gai Waterhouse & Adrian Bott-trained Ecuador ($6.50) coming off a last behind Winx in the Group 1 George Main Stakes (1600m) and last year’s ATC Derby winner Tavago ($8.50) carrying 57.5kg and the 59.5kg top weight respectively. See below for the full JRA Cup 2017 field, barriers, jockeys, weights and latest odds on the Moonee Valley night racing showdown provided by Ladbrokes.com.au.